Scientists from the Center for Genomic. Regulation in Barcelona, Spain have discovered a genetic regulatory network that revolves around a protein called Mel18. This regulatory network acts as a genetic switch during the differentiation of embryonic stem cells into heart muscle cells. Mel18 acts in combination with a vitally important set of proteins called the “Polycomb Regulatory Complexes” or PRCs. PRCs are probably one of the major repressors of genes in adult and embryonic stem cells, and in this paper, Luciano De Croce and his colleagues showed that Mel18 acts with the PRCs to suppress gene expression. 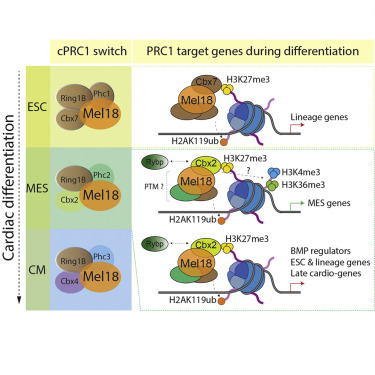 Beyond that, however, once differentiation occurs, Mel18 combines with other proteins to continue to shut off the expression of unnecessary genes, but during early cardiac development, Mel18 completely shifts and becomes a driver of gene expression. It shifts its function by forming new complexes with other proteins that regulate gene expression in various ways. Thus Mel18 acts as a genetic switch that guides stem cells into the cardiac fate and eventually into the heart muscle cell lineage. This fascinating work, which was published in the journal Cell Stem Cell, can help stem cell scientists grow better heart muscle from induced pluripotent stem cells in the laboratory. It could also elucidate the underlying causes of heart defects in congenital heart disease. They may also lead to new ways of controlling stem cells in the laboratory to grow cellular repair kits and patches for patients with damaged or sick hearts.